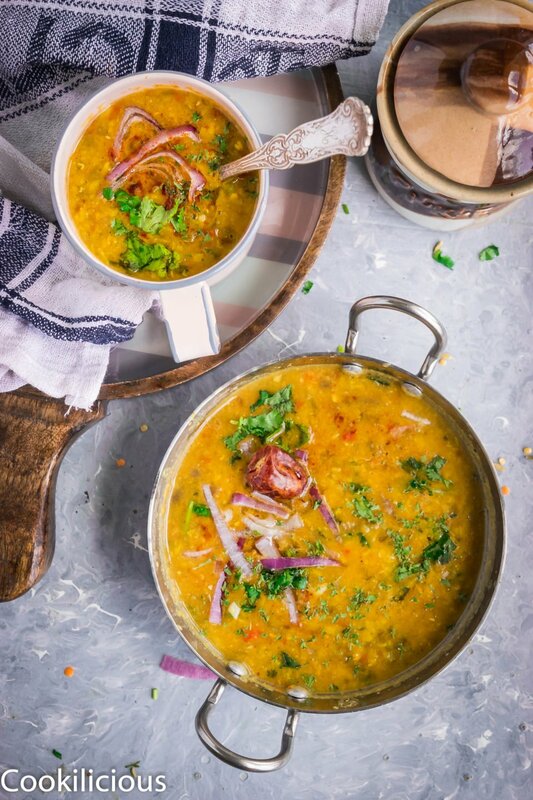 This is an Indian style rustic lentil curry made with green moong sprouts & aromatic spices! A tasty Dal-Fry recipe that can be enjoyed everyday with rice. What more can I say about the Indian Dal that I have not said before! 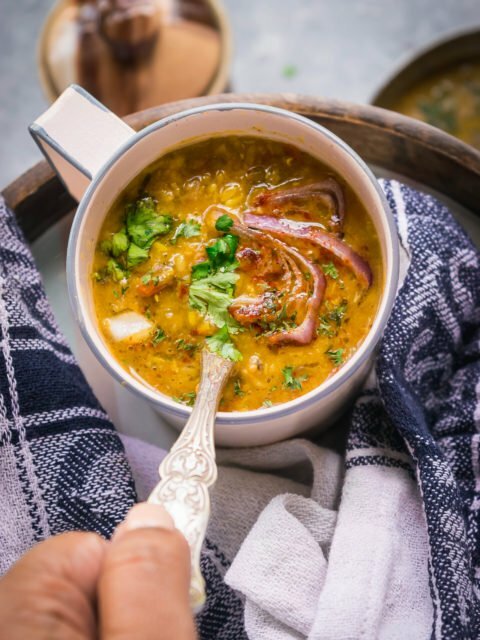 We Indians love our Dal which is probably the most sought-after dishes in the Indian cuisine. Lentils may have made a grand entry in the west but we have been consuming lentils since ages. Many of our dishes use lentils in some proportion. A handful could be added in tadka to give a crunch to the dish or it could be added in a stew like sambhar or rasam or kootu where lentils blend with veggies or a broth, they could also be used to make some delicious snacks that can be fried or steamed, you could use them to make crepes or pancake batter, or it could also be the main ingredient in a dish like the Indian Dal. 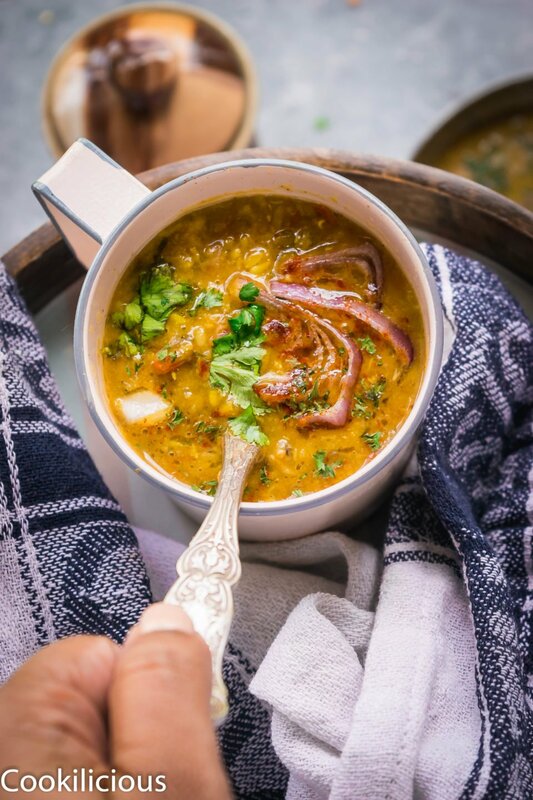 Here the soul of the dish is lentils and other ingredients are added only to enhance the flavor. Lentil salads and burgers are relatively new but great recipe ideas to make using lentils. 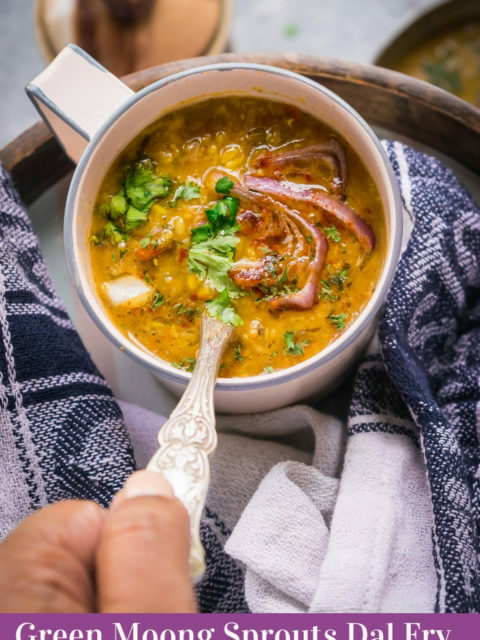 My mom would always include a lentil based dish on the menu every single day. In fact one of my most favorite dish is steamed rice, ghee and plain mashed lentils! It is like comfort food for me and no other food in the world can make me instantly feel better than this dish. It is so good for the body that even babies are fed this. Like rice, lentils are also part of our staple diet. from a friend whose house we had gone for dinner the other day. Since we loved the taste of the Dal she had prepared, I asked her for the recipe. She mentioned that she had used this particular masala to give it more flavor. I was intrigued and added it to my shopping list instantly. Ever since I got it, I was looking for an excuse to use it. The moment arrived and how! It was the chaat party that we had yesterday which gave me the opportunity to create two new dishes in my kitchen – Vegan White Pattani Kuzhambu and Green Moong Sprouts Dal Fry. If you wondering how that can happen, allow me to explain. We had a Potluck Party yesterday at a friend’s place where the menu was Indian Street food – Chaat. There was Samosa Chaat, Pani Puri, Bhel Puri and Sev Puri. I had prepared Semolina Vegetable Bites which was not chaat but was still a fun finger-food. They were all gone within minutes of serving and then everyone was all geared up to enjoy desi chaat. In a couple of hours, we were having major food coma because everyone overrate but still there were leftovers.
. On our way back home, I was already looking for recipes where I could use them together or separately. I asked my girlfriends for recipe ideas and many of them suggested that I make usal using them. But that idea didn’t excite me that much. KR suggested that I do not mix them in one dish as they have distinct flavors. He made sense. I thereby decided to make 2 different recipes. I got the idea to make White Pattani Kuzhambu by talking to the oldest living member of my family and for this recipe, I decided to go with my gut. Ever since we started meal planning for the week, I wanted us to consume lentils in some form every day. So I decided to make a new variety of Dal every week. Since I had cooked moong sprouts handy, I thought of using them this week to make my Dal. The recipe was pretty much impromptu and thankfully it turned out awesome. Without much ado, let me show you how to make Indian Style Green Moong Sprouts Dal Fry.
. Mix it well and bring it to a boil. Since everything is already cooked, this should not take long. Once done, take it off the flame and garnish it with sliced onions and chopped cilantro. Indian Style Green Moong Sprouts Dal Fry is ready! Serve it as a soup or as a side to rice. A protein and fiber rich meal for vegetarians and vegans. 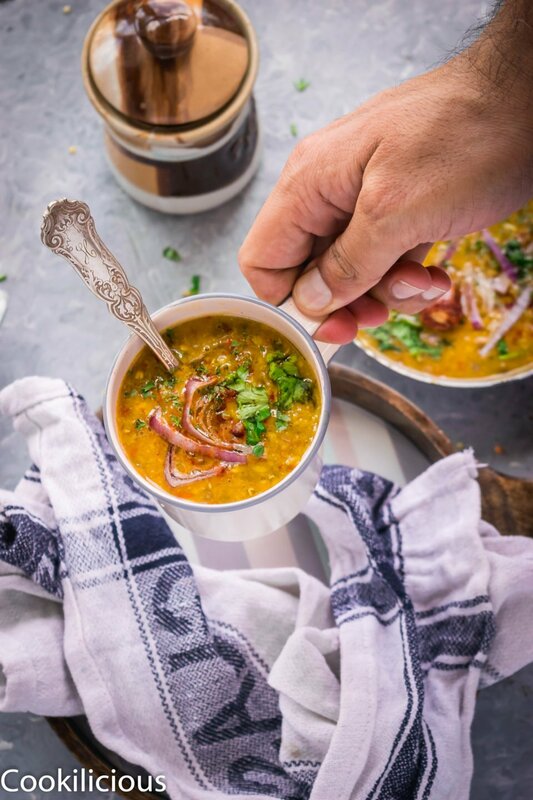 Soak moong dal and masoor dal in water for 30 minutes. 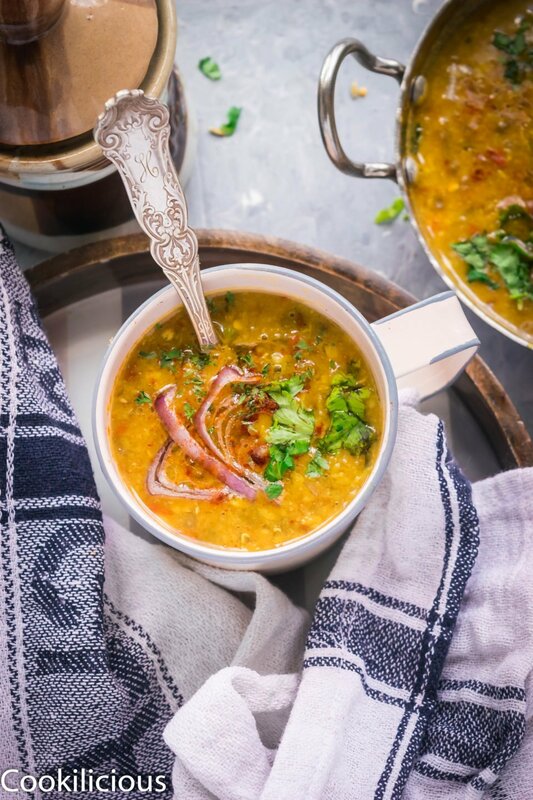 Boil the soaked lentils in a pressure cooker or an Instant Pot in salt + turmeric water. You can use uncooked or cooked moong sprouts in the recipe. If using raw, ensure that they have sprouted and then boil the moong along with the other lentils. Since I had cooked moong sprouts, I skipped this step. Once they are cooked, proceed with the next step. Heat oil or ghee (if you are not vegan) in a pan. Temper cumin seeds and once they crackle, add chopped cilantro, curry leaves and bay leaf. Fry this for 45 seconds and then add chopped onions, red or green jalapeno, minced garlic and crushed ginger. Saute all of this till the onions turn translucent. Then add chopped tomatoes along with salt. Cook it till the tomatoes are soft and pulpy. Then add the sprouts, cooked lentils to the pan along with water and dal masala. Add more water if you need to. Mix it well and bring it to a boil. Since everything is already cooked, this should not take long. Once done, take it off the flame and garnish it with sliced onions and chopped cilantro. Indian Style Green Moong Sprouts Dal Fry is ready! Serve it as a soup or as a side to rice. In case you don't have dal masala, you can add garam masala or any curry powder. But the dal masala will enhance the flavor the best. You can squeeze lemon juice as the final step before serving. You can prepare this recipe using any available lentils. Love lentils but you have exhausted all possible ways to incorporate them in your food? 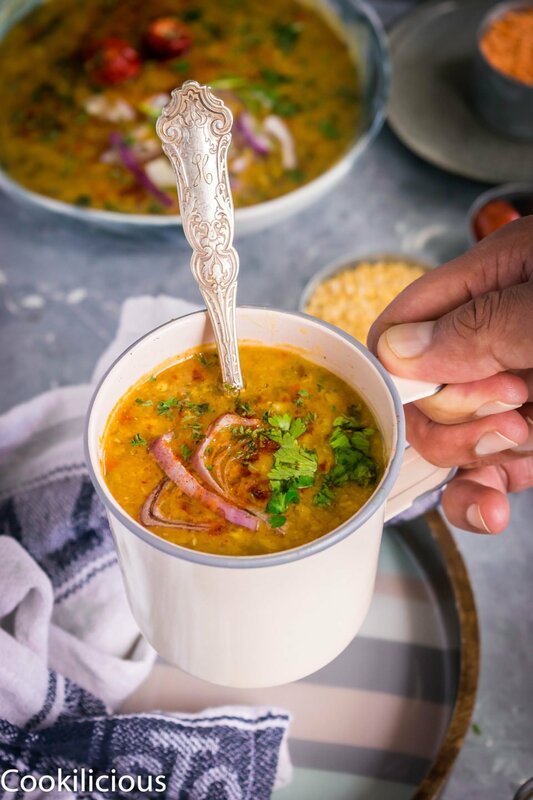 Check out these recipes for inspiration – Spicy Quinoa & Red Pumpkin Adai | Lentil Dosa, Indian Dal Shorba | Lentil Soup Recipe, Spicy & Steamed Vegan Lentil Balls, Kale Adai | Kale & Lentil Savory Pancakes, Lentil & Rice Noodles | Paruppu Sevai, South Indian Medu Wada | Lentil Fritters, Methi Dal | Fenugreek Lentil Stew, Raddish & Lentil Stew, Lentils Beet Soup with Baked Naan Chips, Lasooni Dal Palak/Lentils Soup with Spinach & Garlic, Moong Dal Spinach Chilla | Lentils & Spinach Crepes and Lentils & Black Rice Burger. This is an amazing lentil dish I could eat at any time of the day. I love all those aromatic spices. I always want to use lentils but it’s not something I grew up with, I’m feeling inspired now! Such an informative post on some seriously delicious looking food! This delicious looks so beautiful! And I just love lentils. i didn’t learn to love them until grad school and now I can imagine eating them everyday. They’re such an easy food to consume and they can take on so many flavors! Can’t wait to try this!! Simple and delicious and best healthy Dinner option always. Love it.